Matthew Hughey spent over a year attending the meetings of a white nationalist group and a white antiracist group. Though he found immediate political differences, he observed surprising similarities. Both groups make meaning of whiteness through a reliance on similar racist and reactionary stories and worldviews. Terese Jonsson finds White Bound to be both fascinating and horrifying, and ultimately a useful contribution to the sociology of race. White Bound: Nationalists, Antiracists, and the Shared Meanings of Race. Matthew W. Hughey. Stanford University Press. August 2012. Despite having elected (and re-elected) a black president, the United States is far from “post-racial”. Racist discrimination and inequality continues to be deeply embedded across institutional structures and culture. Yet the mainstream (white) discourse that racism is now a thing of the past does present different challenges for antiracist work. If the majority of white people claim not to be racist, then how come racism continues to be held so firmly in place? Matthew W. Hughey, professor of Sociology, African American Studies, and Gender Studies at Mississippi State University, suggests some of the answers may be found by studying the everyday discursive work white people do in constructing their racial identities. 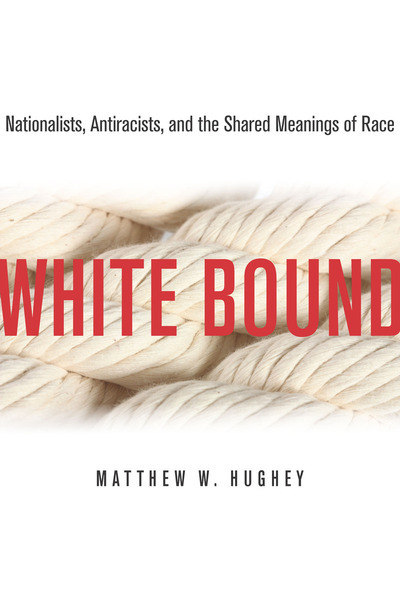 In White Bound: Nationalists, Antiracists, and the Shared Meanings of Race, he presents his ethnographic research with members of two organisations that may be thought to represent opposite poles in terms of articulations of race: white nationalists and white antiracists. For a year, Hughey, a white sociologist, spent a day a week with members of each organisation, pseudonymously called National Equality for All (NEA) and Whites for Racial Justice (WRJ). He hung out in their offices, attended meetings, visited members’ homes, and went to social events. His aim was to examine how the research participants made sense of their own whiteness: how “racial meaning making” happens in everyday spaces and conversations. Interestingly, the demographic membership of both groups was remarkably similar – comprising mostly of lower to upper-middle class white men (there were only three women involved across both groups) in their 30s and 40s, mostly single/divorced, from Judeo Christian backgrounds. But their political views, as one would expect, differed sharply: Members of NEA believed in the intellectual superiority of white people, and campaigned for racial segregation, while WRJ members believed that white people benefit from unearned privileges, and must become conscious of the way they benefit from racism in order to unlearn it. Despite these political differences, however, Hughey suggests that the members of these organisations were more similar than they might like to think. And, he argues, their articulations of white identity reveal a lot about contemporary understandings of race: “It is not that NEA or WRJ are atypical – it is quite the opposite. These two groups demonstrate patterns of racial meaning making that more and more white Americans might share.” (p. 190) While he may have focused on similarities between the two groups at the expense of some of their differences, this is done for a good reason, and raises important challenges to white ‘antiracist’ activists and scholars (whom I presume will have more interest in this book than white nationalists). Through presenting and then analysing interactions and conversations he witnessed, Hughey demonstrates how much of the ‘race talk’ of both NEA and WRJ reveals an investment in constructing ideal white identities. In a chapter titled ‘White Panic’, he shows how members of both groups reproduce a narrative of black pathology and violence, in which they situate themselves as morally upright white saviours. The nationalists attribute black pathology to black men’s supposed innate violent nature, while the antiracists argue that black men can’t help but be violent, as a response to their emasculation by a racist society. While their explanations differ, they arrive at equally racist and paternalistic conclusions: black men can’t help but be violent, therefore we must save them from themselves. In another chapter, ‘Saviors and Segregation’, Hughey shows how this narrative of black men’s violence becomes instrumental in articulating a logic of racial segregation. Gendered policing becomes central here, with NEA members arguing that segregation is necessary to protect white women from black men, and WRJ members positioning themselves as the protectors of women of colour. Hughey relates a particularly disturbing incident, when a member of WRJ tells women of colour at a domestic violence shelter to “[s]tay out of black and lower-class neighbourhoods” and not to “go to black men’s houses at night” in order to protect themselves from further violence (p.139). While the existence of formal ‘white antiracist’ organisations is something which seems quite unique to the US (and is explained as a legacy of the civil rights era), the problematic patterns of behaviour of white ‘antiracists’ is certainly something which has resonance among white-dominated activist communities attempting to ‘do’ antiracism in the UK as well. Hughey’s demonstration of the centrality among such communities of the pursuit for an ideal white identity is particularly useful for unravelling the problematic logic underlying many white people’s attempts to ‘perform’ their antiracism as a ‘good white person’, rather than, say, organising against police brutality or immigration laws. At times, I felt his theorising could have been stronger had he drawn more widely on existing literature on whiteness. In particular, his focus on the construction of a ‘white antiracist’ identity reminded me of Sara Ahmed’s work on the ‘non-performativity’ of white antiracism (see ‘Declarations of Whiteness: The Non-Performativity of Anti-Racism’, Borderlands e-journal ), which could have provided more depth to his argument. White Bound is both fascinating and horrifying, and a useful contribution to the sociology of race. In particular, I think it could be an important read for white people who want to challenge racism. While ‘critical whiteness studies’ remains a field charged with anxiety over its persistent fear of re-centring white people in scholarship on race, this book shows its productive uses, in exposing how white people’s everyday racial meaning making can reproduce and uphold racist structures and discourses, despite ‘good’ intentions. In doing so, it also points us (and white people specifically) in the direction of how these processes can be interrupted and challenged. Terese Jonsson is a PhD student in the Faculty of Social Sciences and Humanities at London Metropolitan University. Her research looks at the stories which are told about the feminist past in England in relation to issues of race and racism, and the effects these have on contemporary feminist politics. She is an organiser of the ‘Race’, Ethnicity and Post-colonial Studies PhD Symposium taking place at London Met in June 2013. She blogs at Between the Lines and tweets as @missing_words. Read more reviews by Terese.